At Budget Blinds of Middletown CT, we're your local neighborhood experts that truly understand your needs. We're in your neighborhood, we know the local Middletown CT weather and community, and we’re backed by the #1 provider of blinds, shades, and drapes in North America. Over 25 years of customer satisfaction gives you peace of mind that only comes with choosing the proven leader. We bring the showroom to you in Middletown CT. We expertly measure your space, install beautiful window treatments, and back it up with the best warranty in the business so you can sit back and relax in the beautiful, Middletown CT weather and sunshine. We serve to give you the best in window treatments, so you can rest easy knowing your space will be beautified and optimized with window treatments that fit your individual needs. Welcome to Budget Blinds of Middletown, your leading full-service resource for fashion-forward window treatments. As a locally-based, family-owned business, we pour our heart and soul into brightening your windows and your day. 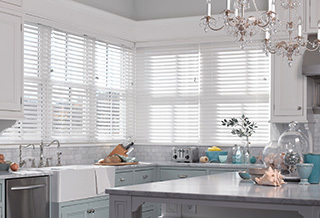 From versatile blinds to elegant shades and drapery, to feature-rich, artisan-inspired shutters, our brand of superior “window therapy” will make you wish you’d called us sooner. And to ensure you like what you see before you order, we bring our entire showroom of stylish, innovative window fashions to you in the comfort of your own home. This FREE in-home design consultation is, by itself, a remarkable value. So if you’re ready to brighten your day with stunning new window treatments from America’s #1 provider of custom window fashions, then reward yourself by partnering with Budget Blinds of Middletown. Attention to detail, personalized service, and an outstanding selection in premium, yet affordable window fashions makes us the obvious choice to upgrade your home and your Middletown lifestyle. So if you’re near Wadsworth Falls State Park, Wesleyan University, or another area of Middletown, rest assured our experienced team of highly trained designers and installers are ready to frame your windows in a whole new light. Call or click today and see what Middletown is talking about when it comes to enduring style in window fashions. Lori and Bill were very patient, courteous, and professional! A pleasure to work with. I loved the honeycomb blinds in the kitchen. The small leaf design blends so well. Excellent workmanship - Great job! Bill and Lori did a fantastic job with all of our blinds. I recommend them highly; we could not be more happy with the work they did. Lori helped with all the colors we needed and Bill did an excellent job installing all of them. The pricing was great, and the 5 year guarantee is unbelievable! Thank you both so very much! Monday - Friday 9 a.m. to 5 p.m. Saturday - 9 a.m. to 3 p.m.